Kia's Niro EV is to go on sale in the U.S. in 2019. SEOUL — Kia will bring its second full-electric global model to the North America next year in a bid to tap a sweet spot in the crossover market. 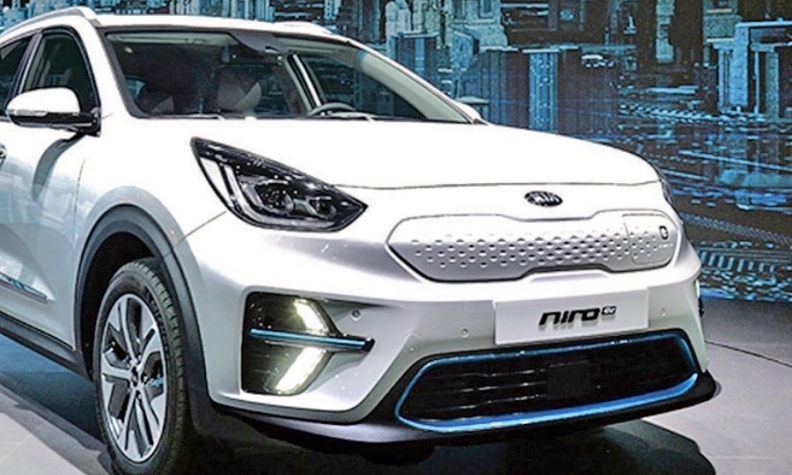 The Niro EV, which follows the subcompact Soul EV in Kia's battery-powered lineup, options a 64-kilowatt-hour battery that Kia says will deliver a range of 384 km (239 miles) on a full charge. It fleshes out an eco-friendly Niro family that already includes hybrid and plug-in hybrid variants. Kia has sold more than 210,000 of the cars globally since their 2016 debut. Kia will bring the Niro EV to Europe by year end, the company said. It went on sale in South Korea in July and sales reached 976 through August. Kia hopes the Niro taps into surging demand for crossovers with a more affordable EV offering, as luxury brands bring electrified vehicles into the high end of the segment. The front-wheel- drive Niro EV will be offered with two lithium ion polymer battery choices: a standard 39.2-kilowatt- hour battery pack and the long-distance 64-kilowatt-hour one. The base battery is mated to a 100-kilowatt motor that accelerates the vehicle from 0 to 62 mph in 9.8 seconds. It has a range of 246 km (153 miles) on a full charge, Kia said. The bigger battery is paired with a 150-kilowatt motor that goes from 0 to 62 mph in 7.8 seconds. Kia's design centres in California and Namyang, South Korea, created the vehicle. The EV variant gets a new LED rear light design. A solid grille and recharging plug flap in the nose accentuate the electrified look. Inside, the Niro EV also differs from its nameplate variants by ditching a traditional gear shifter for a shift-by-wire dial. A color liquid crystal display driver instrument cluster, up to 7-inches wide, depending on market, is also exclusive to the Niro EV, Kia said.